A police officer in Kansas mistakenly shot a man when she pulled out her gun instead of her taser. 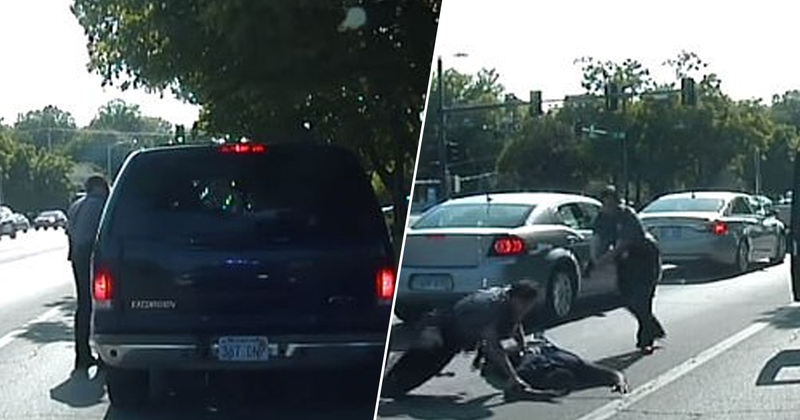 Dashcam footage from the incident, which happened in the city of Lawrence, shows officer Brindley Blood shooting and wounding 35-year-old Akira S. Lewis in May last year, after they got into a row over a seatbelt violation. The video shows Lewis arguing with the officers, suggesting he’s been pulled over not for his seatbelt but because he’s black. The argument intensifies between Lewis and the other officer, with Lewis being dragged out of his vehicle and fighting with the male officer. As they both fall to the ground, officer Blood runs over, pulls what she thinks is her taser from her belt, and shoots Lewis. Thankfully, Lewis survived the incident and was taken to hospital to have his injuries treated. He was later charged with a number of misdemeanors, including battery against a law enforcement officer, according to the Kansas City Star. Officer Blood was placed on paid leave after the incident, and subsequently resigned from the police force. She was charged with aggravated battery. According to MailOnline, the affidavit in the case against officer Blood said she didn’t realise she had pulled her gun instead of her taser until she noticed there were no wires coming from the weapon. During an interview with investigators, she reportedly said: ‘I shot, shot him, I pulled my firearm instead of my taser’. The video was not initially released as it was ‘part of an ongoing investigation’, however it has now been made public after it was played during officer Blood’s court hearing. The charges against Blood allege she was acting recklessly, though her attorneys argue that – despite the mistake – she was not reckless and the charges should be dropped. The ruling is scheduled to be announced later this week. According to Lewis’ attorney, Shaye Downing, during the officers’ attempt to arrest Lewis for a ‘seatbelt violation’, the police ‘initiated physical contact and escalated a situation that could have been easily de-escalated by any number of interventions’. The attorney added that Lewis is yet to receive any help from the city of Lawrence for medical expenses incurred as a result of the shooting.